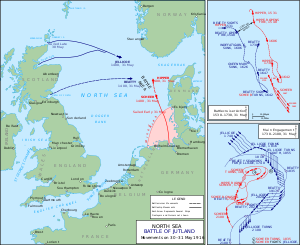 The Battle o Jutland (German: Skagerrakschlacht, the Battle o Skagerrak) wis a naval battle foucht bi the Breetish Ryal Navy's Grand Fleet unner Admiral Sir John Jellicoe, against the Imperial German Navy's Heich Seas Fleet unner Vice-Admiral Reinhard Scheer during the First Warld War. ↑ Throuoot this airticle the terms "torpedo boat" (sometimes "torpedo-boat") an "destroyer" are uised interchyngeably tae refer to the same cless o vessels in the German Navy. This page wis last eeditit on 11 Dizember 2015, at 04:22.